DHA Capital and Continental Properties’ 12 East 13th Street is back. The eight-unit luxury garage-to-condos conversion in Greenwich Village started sales in November 2013. The listings were pulled in October 2014, after failing to sell, Crain’s reported. 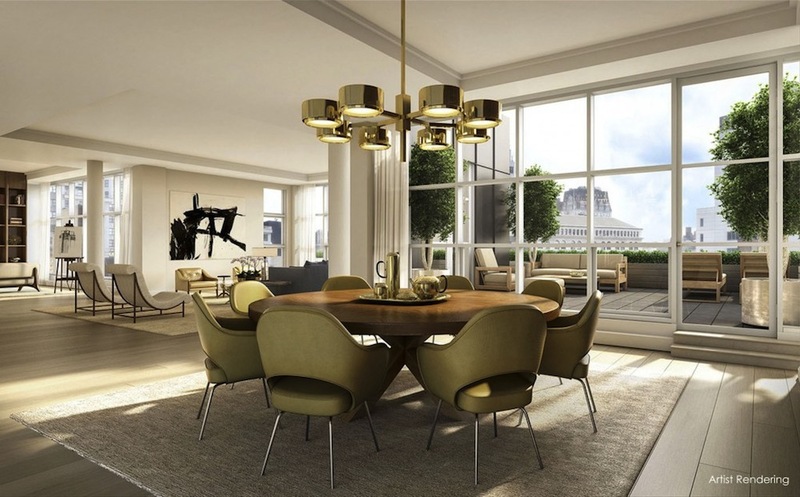 However, six of the units are now back on the market, priced from $6.95 million for a 2,816-square-foot three-bedroom to $30.5 million for the 5,704-square-foot penthouse. Residence 4 is asking $11.25 million, a 12 percent decrease from its previous listing price of $12.75 million, and Residence 7 got a 7 percent price cut from $7.5 million to $6.95 million. CetraRuddy designed the facade and interiors. The homes include four 4,800-square-foot four-bedrooms, two floor-through duplexes with private terraces and the aforementioned penthouse. Interiors have great rooms that extend across the entire 67 feet of the building’s front facade, “extravagantly large rooms,” full-height sliding glass doors and kitchens with appliances by Miele, 70-bottle Gaggenau wine coolers and islands with dual dishwashers and ice machines. The triplex penthouse has four bedrooms, 4.5 bathrooms, two terraces, a private elevator and a sculptural wood and glass staircase throughout the three levels. Each residence comes with a private parking space and a storage room. Amenities include a 24-hour doorman, gym and bike storage. DHA and Continental purchased the 1930 building for $32 million in 2012 and added a four-story glass topper to the original eight-story structure. Cantor Pecorella is handling marketing and sales.